Could life as we know it have developed if fundamental physics constants were different? 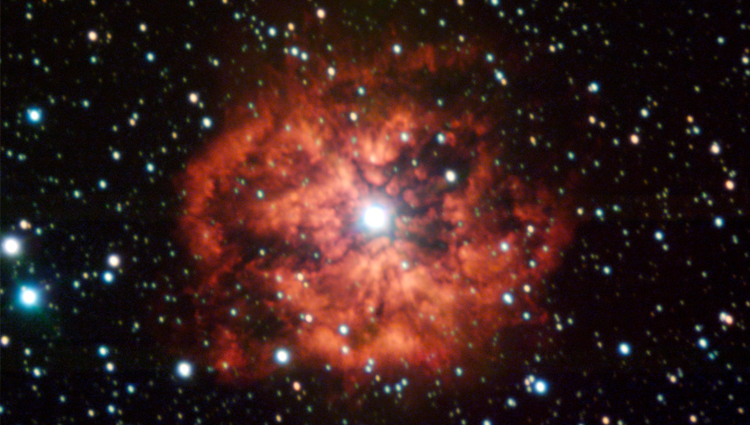 M1-67, the youngest wind-nebula around WR124, a Wolf-Rayet star. (Inside Science) -- For all the progress physicists have made in figuring out the universe, they still don't know some pretty basic things. Why, for example, do fundamental particles possess the specific values of mass that they have? Presently, physicists have no explanation for this and similar questions. They do know something pretty significant, however. If the masses of particles or the values of fundamental constants were much different from what physicists have measured, carbon-based intelligent beings might not be here to measure them, because fundamental particles might not assemble into stable atoms, atoms might not form rocky planets and dying stars might not produce the chemical elements we find in our bodies. These observations have led some physicists to describe the universe as "fine-tuned" for carbon-based life. Imagine the universe is like a machine with dials used to set the properties of each important piece -- from the masses of the constituents of protons and neutrons to the rate of expansion of the universe. If many combinations of dial settings yield conditions in which complex life can evolve, physicists would say the universe is not fine-tuned. But if some of the dials have to be set very precisely to values that are not readily explained by theory, physicists would consider these parameters to be fine-tuned. Physicists have recognized for decades that certain parameters do seem to be fine-tuned. The most fine-tuned of these parameters seems to be the cosmological constant, a concept that Albert Einstein proposed to provide an outward-pushing pressure that he thought was needed to prevent gravity from causing the universe's matter from collapsing onto itself. For the parameters that describe forces inside the atom, physicists have few hints at how fine the tuning is. In other words, how many different dial settings would create a universe that supports life as we know it? The recent development of extremely powerful computers that can crunch through a thousand trillion calculations per second has now made this possible, said Meissner. With these computers, he said, "We can explore worlds where the constants have different values." The scientists also varied the fine structure constant, which accounts for the strength of the electromagnetic force between charged particles. The strong force must overcome the electromagnetic force to bind protons and neutrons into stable nuclei that make up the familiar chemical elements: helium, carbon, oxygen and all the rest. The values of the average quark mass and the fine structure constant together also form a deep mystery. While the universe's matter is almost entirely hydrogen and helium, humans and other life forms on Earth are, by weight, mostly oxygen and carbon. All of that carbon and oxygen was produced in now long-dead stars, when they had finished fusing nearly all their hydrogen fuel into helium, and began fusing helium into heavier elements. In the 1950s, Cambridge University astrophysicist Fred Hoyle worked out the physics of how stars produce these heavier elements. He found he could explain the abundances of carbon and oxygen on Earth only if the quark mass and the fine structure constant took on values that made the nuclei of helium atoms in stars far more likely to combine to form nuclei of carbon atoms than they otherwise would be. Without this increased probability, called a resonance, stars would not produce enough carbon to make life as we know it. To Hoyle, these two parameters seemed to require a very precise setting of dials. He therefore called the resonance an example of fine-tuning. To try to test how fine-tuned Hoyle's resonance is, Meissner's team ran a series of simulations with different average quark masses and with different fine structure constant values. As described in a paper published in December in the journal Science Bulletin, they found that if they gave either constant a value around two to three percent larger or smaller than its measured value, dying stars could still produce enough carbon to account for the amount we see on Earth. Previously, other groups found similar results for the fine structure constant, but Meissner's group was the first to study what happens if the quarks' mass varies. Meissner acknowledges that the research does not answer why the values are what they are. To explain this, some physicists invoke a concept called the "multiverse," in which "parallel" universes with many different possible values of the constants exist, and we, unsurprisingly, find ourselves in one in which complex life can evolve. Meissner says his team's work "gives some credit" to this concept, but does not explain how the many universes would be generated. "This paper strengthens the case for the fine-tuning of the universe," agrees Luke Barnes, an astrophysicist at the University of Sydney. Meissner's team's model of the carbon atom is more advanced than previous efforts, he said, especially because they can change the mass of the quarks. But Barnes noted that Meissner's team did not find an exact threshold for the quark mass above or below which the Hoyle resonance no longer appears. Rather, they seem to have identified a "safe zone" within which the quark mass can vary. Barnes hopes that further research will reveal what would happen beyond the safe zone. Others are less impressed. David Kaplan, a particle physicist at Johns Hopkins University in Baltimore, said two to three percent gives the quark mass a lot of wiggle room compared to other much more finely tuned parameters within physics, including the cosmological constant. "[Two to three percent] doesn't seem very fine-tuned to me," Kaplan said. And more broadly, Kaplan says Meissner's simulations address only whether the specific kind of carbon-based life we know could exist, not whether universes with different parameters could support other kinds of complex life that we can't even imagine. "Maybe if you change the quark masses not by three percent but by 50 percent you could end up with a situation where life as we know it couldn't exist, but life as we don't know it could exist," he said. Alejandro Jenkins, a high-energy physicist at the University of Costa Rica, agreed that the window of variability in quark mass probably does not qualify as fine-tuning. But he said that Meissner and others have improved physicists' understanding of how the forces binding atomic nuclei together depend on the quark mass. "That's what Meissner and his collaborators have made the most progress on in the last few years."